Sophisticated and streamlined, contemporary influences have resonated in home design in the last several years, and are now making their way into bathroom styling in a big way. The open feel of a contemporary bathroom wall mount bathroom sink gives the illusion of suspension in mid-air and creates the ultimate contemporary statement. The Ronbow sink above (Free from the Signature Collection) adds elegance to the every day with its minimalist yet fully functional style. 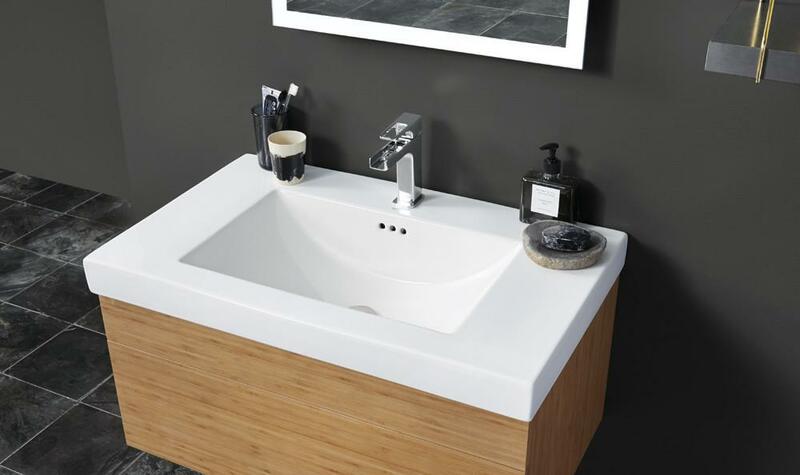 The wall mounted sink is fast becoming a signature of contemporary bathroom style. Inspired by cutting-edge spa design and the need to relax from the daily grind, contemporary style is comfortable and easy on the eyes, providing a linearity and balance to the room’s composition. Whether paired with a sink wall mount vanity or on its own, a wall mounted sink lends an easy lightness to the room. Give your contemporary look a dose of warmth with natural materials such as wood. The addition of some accents in the room from nature such as a vase with dried grasses or fresh flowers will help soften the lines and angles. Your wall mounted sink can be a place for some dramatic flair in your bathroom. 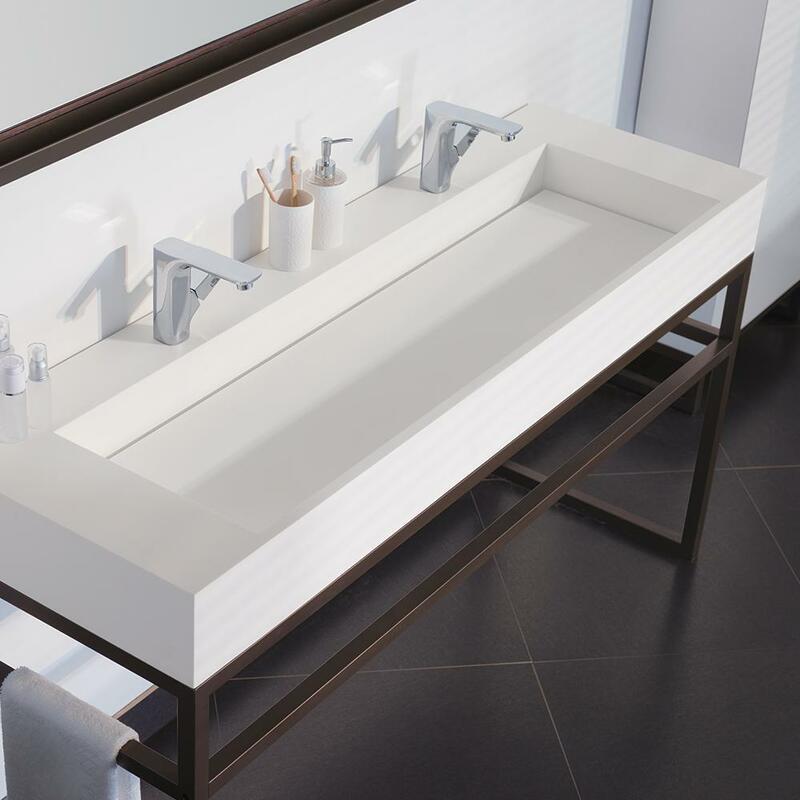 Wall mounted sinks can be integrated into a countertop or sit as a vessel on its own. A vessel bowl is often paired with a distinctive wall mount sink faucet to create a distinctive focal point and visual interest. A sink wall mount can be a dramatic statement of its own when the countertop contrasts with the wall it is attached to. A common solution that carves out extra space in rooms is either a wall mount kitchen sink or a wall mounted bathroom sink. It has been used as a design detail in rustically inspired kitchens and industrial bathrooms as well. Available in a variety of sizes, a sink wall mount can really make an impact in either a large or small space. With extra space comes versatility and the ability to explore numerous bathroom layout options. 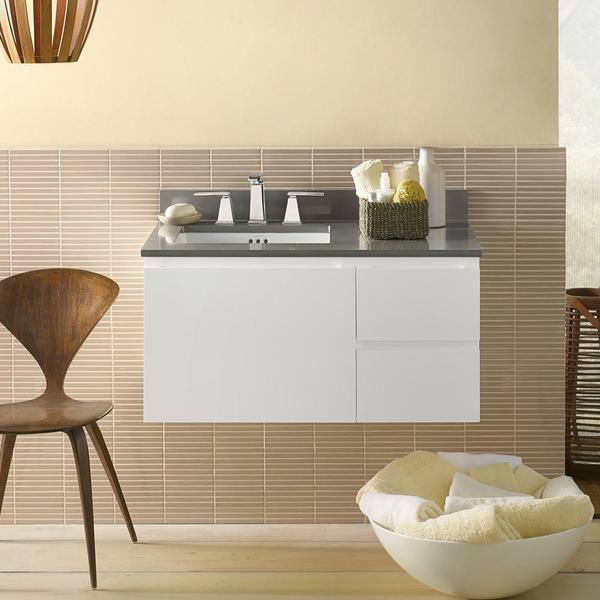 Contemporary wall mount sinks can live largely and still stay true to the minimalist trend. Sinks with more than one wall mounted sink faucet make a striking rectangular form that can be complemented with a dominant mirror above the basin. This Marco wall mounted sink from Ronbow’s Signature Collection is large in scale but never looks bulky because of its sleek styling. The area below the wall mounted sink can get used as a storage area for towels, or just left empty to create openness in the room. Wall mounted sinks are a versatile choice for a bathroom that is able to take a supporting role or act as the distinctive focal point for the whole room. With the versatility, the ability for creative use, and space saving features that it offers, a wall mounted sink is both a practical and enduring style choice. A utility sink wall mount style is a contemporary nod to industrial design and can complement a variety of bathroom layouts. Even if you decide to change your bathroom’s style approach in the distant future, it is likely that your bathroom sink wall mount can stay. Sleek and uncluttered, the contemporary trend that is influencing home design has come into its own in bathroom design. A contemporary sink wall mount that has strong lines and avoids extra ornamentation will be a style staple for years to come. Ronbow is your source for a wall mounted sink that will fit perfectly with your space and style. Quality materials and workmanship are what set us apart as a premier bathroom furnishing company.